Major League Baseball continues to think that embarrassing individual players like Manny Ramirez is the best path to cleaning up the sport. 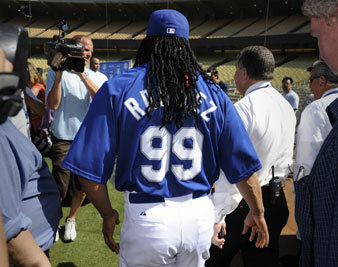 Los Angeles Dodgers Manny Ramirez speaks during news conference at Dodgers Stadium in Los Angeles. You would think that Manny Ramirez was caught fighting pit bulls alongside Martha Stewart. The sports radio and comment boards have been cesspools of racism. It’s always easy to hate, especially someone who plays a game for a living and makes millions of dollars. The decision ends a stretch where the former World Series MVP was reviving baseball in Los Angeles, leading the Dodgers to a 21-8 start and a record thirteen straight wins at home to open the season. Los Angeles, a town built on artifice and home to hordes of performance-enhanced entertainers, not to mention led by a performance-enhanced governor, now demands purity of its athletes. This is a column that aims not to “defend” Manny Ramirez but to condemn Major League Baseball’s steroid idiocy. Besides, the quizzically quirky Ramirez is not, at this point, defending himself. Ramirez will not appeal the suspension, and he apologized, issuing a brief statement that read in part: “I saw a physician for a personal health issue. He gave me a medication, not a steroid, which he thought was okay to give me.” But MLB, in a typically classy move, has leaked to the press that Ramirez tested positive for the female fertility drug HCG, or human chorionic gonadotropin. Steroid specialists have fanned out across the airwaves explaining that HCG is used to increase testosterone levels, usually after a heavy steroid cycle. The use of a “female fertility drug” also has sports radio hosts in a pubescent tizzy asking if “Manny is a mommy” and ESPN’s Jayson Stark making an “octo-mom” joke. From the juvenile to the pious: President Obama’s press flack Robert Gibbs took time out from explaining why torturers are above the law to tell us, “It’s a tragedy, it’s a shame.” There is a tragedy and a shame afoot, but it is not rooted in the choices of one player. It’s in a baseball culture that continues to think that embarrassing individual players and feeding on the resentment of fans is the best path to cleaning up the sport. Manny has now joined Alex Rodriguez, Barry Bonds, Roger Clemens and many others as permanently stained with a scarlet S. No Hall of Fame, no old timers’ games and a life as a cautionary tale. Meanwhile, we all get taken to the cleaners. We have billionaire owners making scapegoats of millionaire players to soothe our anxieties about the game and our lives. Meanwhile these same owners sit like pashas in a baseball palace that could be called the House That Steroids Built. The man who wrote Juiced knows when a cycle has run its course. Canseco said that he believes the coverage on steroids in baseball has become “overkill” and the spotlight should now be on MLB and the players association. He called it “a complete conspiracy.” He’s absolutely correct. Baseball owners love conspiracies. For more than twenty years they have conspired to attain public funds for ballparks. In 2008, they collectively conspired not to sign the best hitter in the game, Barry Bonds. Now they are committed to the project of keeping the focus on the players, and off of themselves. We shouldn’t let them. If Manny Ramirez is guilty of anything, it’s being caught in between baseball’s clubhouse culture and public sanctimony. He is absolutely correct. We are supposed to tsk-tsk at players who are supposed to “just say no” to their addictions to fitness and monster stats, when their success at the park is our addiction as well. We also have yet to truly take owners to task for their addictions to public money and send them to detox.